Excel Energy’s Hayden Station recently completed an upgrade that now allows the power plant to receive coal by rail. For more than 40 years Hayden Generating Station, a 446-megawatt coal-fired, base-load electric generating plant located in northwest Colorado, received its fuel via truck from the local Seneca mine. In 2001, planning began for the day when the mine could no longer supply the station’s needed fuel due to the depletion of local coal reserves. Ten years later, the project was complete, assuring Hayden Station of ongoing viability for decades to come. Hayden Station is located at 6,500 ft above sea level near Hayden, Colo., 30 miles west of Steamboat Springs. The plant, co-owned by three utilities—Xcel Energy (the operating partner), Salt River Project and PacifiCorp—houses two generating units. Unit No 1 is rated at 184 megawatts (mw) and began operating in 1965; the 262-mw Unit No. 2 began operating in 1976. Together, the two generating units consume up to 1.8 million tons annually of bituminous coal. From the time of initial operations, this coal was supplied from the local mine to the plant via trucks on a dedicated 5-mile long haul road making up to 100 trips per day. 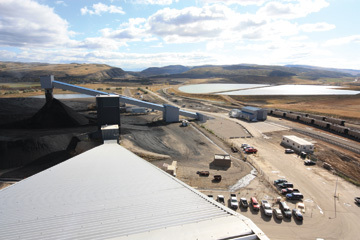 For the future, Hayden Station desired more flexibility in coal sources and the ability to receive coal from either truck or rail. Thus, Hayden Station initiated a new project to provide reliable, long-term coal delivery methods to secure its necessary fuel supply. A project of this magnitude—involving challenges ranging from environmental, agricultural, and transportation effects, to social, cultural, and historical sensitivities, as well as fundamental matters of public health and safety—was bound to generate significant interest among a wide array of constituencies. Recognizing this, the project team made a concerted effort to share information with, and gather input from local landowners and residents; environmental and agricultural interests; federal, state and local officials; the general public; various other entities involved in energy exploration, generation and delivery; and others with a stake in the implementation and outcome of this project. Public meetings and public workshops were held to collect community input. Meeting and consultation with jurisdictional agencies included the U.S. Fish and Wildlife Service (USFWS), the U.S. Army Corps of Engineers, Colorado Department of Transportation (CDOT) and the Colorado Public Utilities Commission (CPUC). • remain a good corporate neighbor to the local community. Figure 1: As project planning progressed, it had to work alongside a number of constraints. Providing an alternative to truck delivery of coal into the plant was a common goal of the community, local governments and the plant owners. Due to increased traffic on the local roads over the years, the community was concerned with traffic safety and therefore sought to minimize trucks from the public roadways. The local government also sought to minimize trucks from the roads as a means of reducing roadway maintenance costs. Hayden Station plant owners sought to reduce dependence on trucking as a sole delivery method. 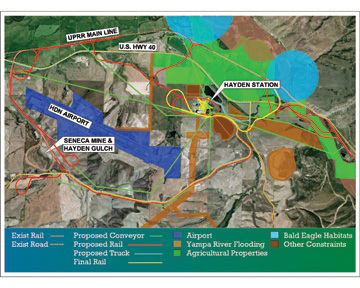 Therefore, an early decision in the planning process was to develop rail service into Hayden Station. This was a primary goal for which nearly all interested parties were in complete agreement. In planning for rail deliveries, three sub-goals that all parties also agreed to, quickly coalesced. There was a desire to plan for full unit train delivery to minimize the number of trains traversing the community and to provide economical fuel costs. Secondly, for safety concerns, any rail crossings of public roads would be constructed as separated grade crossings. And finally, the plant needed to remain operational during the construction period, including continuous receipt of trucked coal. As with most coal-fired electrical generating plants of this vintage, there was room for improvement to the plants coal handling infrastructure. 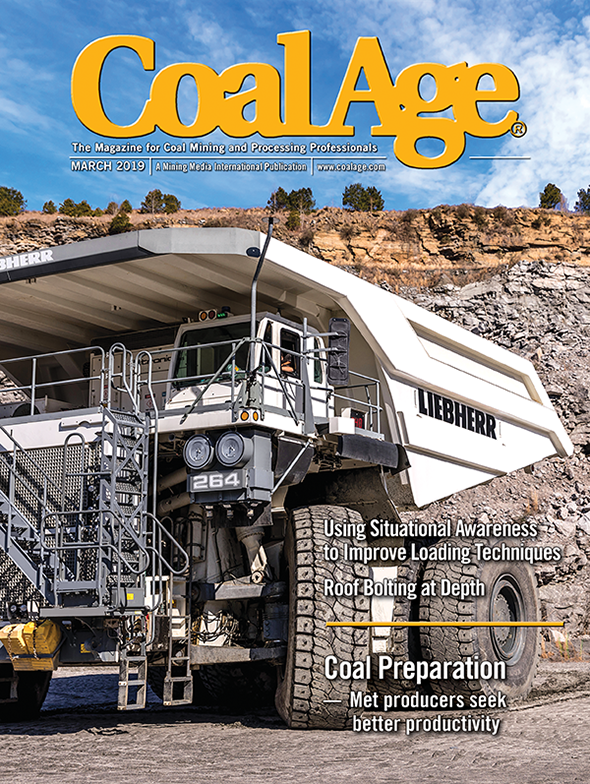 Certain features of the coal handling operations, though designed as standard practices of the 1960s and 1970s, were continual headaches for the plant operators. Wherever possible, such ongoing problems would be improved with any new coal handling infrastructure. A new coal unloading facility—including enclosed hopper, stockpile conveyor and stacking tube—was designed to accomodate either train or truck fuel delivery. Specifically, coal storage was originally configured to stockpile coal after it was crushed causing handling difficulties during wet and cold weather, as well as loss of fine materials during wind and water runoff. Elevating belt conveyors were originally designed with an inclining angle of 17.5°. Such a steep angle forced operators to decrease conveying capacity during cold, icy weather, common during winter months in high elevations of Colorado. Another difficulty that the coal handling operators confronted was plugging of the steel stacking tubes. The third major project goal was to remain a good corporate neighbor throughout the entire project process. Local coal mining and Hayden Station are the largest year-round employers in the county. In addition, the plant provides a large portion of funding for local schools. To accomplish this goal, Xcel Energy committed to a public process including public meetings, workshops, publicity, and individual contact in order to collect community input and involve the community in decision making. Another way the plant owners sought to gain public support for the project was to mitigate any environmental impacts that were encountered. • Wildlife habitat (bald eagle, migratory birds, game animals) and significant agricultural properties. To determine the best new coal delivery method, working with local government officials, the community and various agencies, more than 26 options of delivery routes were studied. Options included rail delivery, truck delivery, and combinations of rail/conveyor delivery and rail/truck delivery. The estimated costs for these options ranged between $15 million and $85 million. In the spring of 2007, after an exhaustive analysis in a public process, Xcel Energy applied to the county for a special use permit (SUP) to obtain the necessary approvals for a rail link from the Hayden power plant to the nearby railroad mainline track. A preferred option was selected from among the 10 alternatives that received detailed analysis. The county approved the permit for the rail link in the fall of 2007. In addition to the major county SUP, at least 22 other permits or approvals were required from various state, county and other interested agencies. Led by CDG Engineers of St. Louis, Mo., detailed engineering began in January 2008. 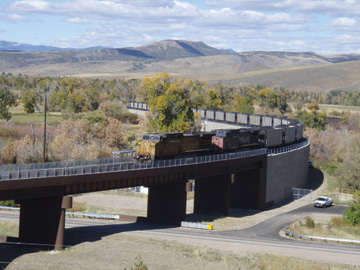 The project was designed in accordance with the county SUP and conditions, mitigation agreements, railroad standards and requirements, and CDOT standards, requirements and agreements. The chosen rail spur route used Xcel Energy’s existing 75-ft wide right-of-way from the existing mainline rail into Hayden Station. Approximately 2,700 ft of the spur passed through designated wetlands of the Yampa River. Careful attention was required to keep the amount of wetland disturbance below 0.5 acre to qualify for a Corps Nationwide Permit 14 for Linear Transportation Projects. During train unloading operations, the train moves continuously over the hopper at 0.232 miles per hour and coal is sent to stockpile at a rate of 2,800 tons per hour (tph). The narrow right-of-way precluded the use of conventional earthen side slopes and a portion of the track was elevated on a system of 22-ft wide parallel retaining walls. These retaining walls were built from 2,200 individual stacked precast concrete units, weighing up to 6 tons each, and having an architectural surface finish with an appearance of natural stacked stones. The rail spur was 1.75 miles long, rising 100 ft in elevation between mainline and the plant, with a maximum grade of 1.6%, and required four new rail bridges—two over public roads, one stream crossing and one wildlife opening. The design required the relocation of major utilities to meet code requirements for track clearances. A high-pressure gas pipeline, 169kV electrical transmission line, 138kV distribution line, and plant raw water pipelines were relocated. A short length of the county road was also relocated. Geotechnical testing was conducted along the rail spur route to ensure that all potential geologic hazards were identified and mitigated. An area of slope instability was discovered and a lateral force resisting system was designed to address the stability issues. 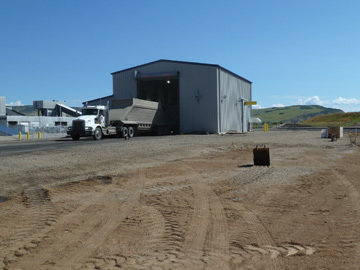 At Hayden Station, the existing coal unloading and coal handling systems were evaluated and considered for modification to allow for the new use of train unloading. It was determined that the existing coal stockpile systems could not be economically modified to safely accommodate the higher demands required for train unloading. A new coal unloading facility—including enclosed hopper, stockpile conveyor and a stacking tube—was designed to accommodate either train or truck fuel delivery. The facility was designed to accommodate a unit train composed of four locomotives and 115 rapid discharge bottom dump coal cars. During train unloading operations, the train moves continuously over the hopper at 0.232 miles per hour and coal is sent to stockpile at a rate of 2,800 tons per hour (tph). Rail car doors are opened and closed automatically. Under design conditions, a 115-car unit train can be unloaded in about 5 hours. A 60-inch wide, 2,800-tph stockpile conveyor was designed to carry coal from below the dump hopper to the top of a new stacking tube. This new, totally enclosed conveyor was designed at a slope of 14.5°, 3° flatter than previous sloped conveyors on the site. 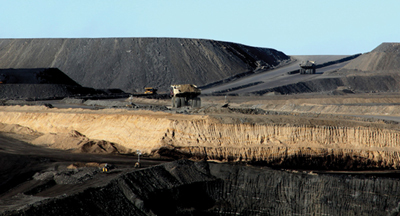 Using a reduced conveyor slope allowed coal to be unloaded at a higher capacity during cold, wet or icy weather than was previously possible. Other major features of the new coal unloading facility include a 95-ft tall concrete stacking tube that can accommodate a 38,000-ton coal pile, a belt magnet, two rail sidings, and two new coal crushers that were installed beneath existing reclaim openings in order to provide the ability to crush on reclaim in lieu of crushing before coal stack out. The construction phase of the project began in the spring of 2009 and was completed in October 2011. Coordination with local officials and residents continued during this phase of the project. The project employed experienced consultants to develop plans, perform studies, and ensure overall project compliance with environmental policies, permits and regulations. All construction contractors were required to submit a site specific Quality Assurance Plan. Contract requirements mandated that the contractor provide submittals for major materials and equipment used on the project. Major construction contractors submitted detailed turn-over packages with appropriate documentation of materials and equipment supplied and work performed. Independent testing agencies were used to verify acceptability of critical work including bridge construction. The first coal train arrives at the Hayden Station on October 10, 2011. All contractors working on the project were required to develop a site specific health and safety plan before starting work and have at least one full-time safety professional onsite. Regular meetings were held with the safety professionals to discuss hazards, performance and corrective actions. A program of Observational Based Safety was used during construction. The program is helpful to engage employees in considering their safety practices and take responsibility for preventing accidents. The data obtained from the observations was used to identify trends of safe and unsafe behaviors and develop action plans to actively eliminate hazards and prevent accidents. 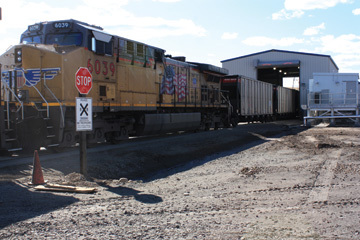 The new rail spur and coal unloading facility has been operating satisfactorily since being placed into service and has performed well during cold weather conditions. The three major project goals were achieved—the plant has secured a reliable and flexible coal delivery method, the plant coal handling infrastructure has been improved and Xcel Energy remains a good corporate member of the local community. James S. Newcomer, S.E., is a principal with CDG Engineers, St. Louis, Mo. He served as project manager for design engineering for the Hayden Rail Fuel Delivery Project. John E. Pierce, P.E., is a principal engineer for Xcel Energy, Denver, Colo. He served as project manager for the Hayden Rail Fuel Delivery Project. 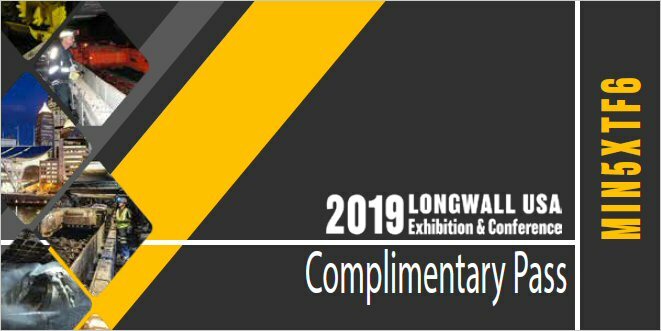 This article was adapted from a presentation Newcomer and Pierce gave at Coal Handling & Storage 2012, which took place during October in St. Louis, Mo. NextMorrow Pacific Project: First Coal Terminal in Pacific Northwest?